What do you think of when you see a pile of winter squash near the back of most fresh produce aisles? Does carrying it home to eat it cross your mind, or is it more of a fall table decoration? Winter squash in particular offers many health benefits. According to an Organic Facts article, "winter quash can boost the immune system, prevent certain types of cancer, improve vision, protect the skin, strengthen the bones, reduce blood pressure, maintain fluid balance, regulate blood sugar and cholesterol, improve digestion, and help maintain proper circulation." 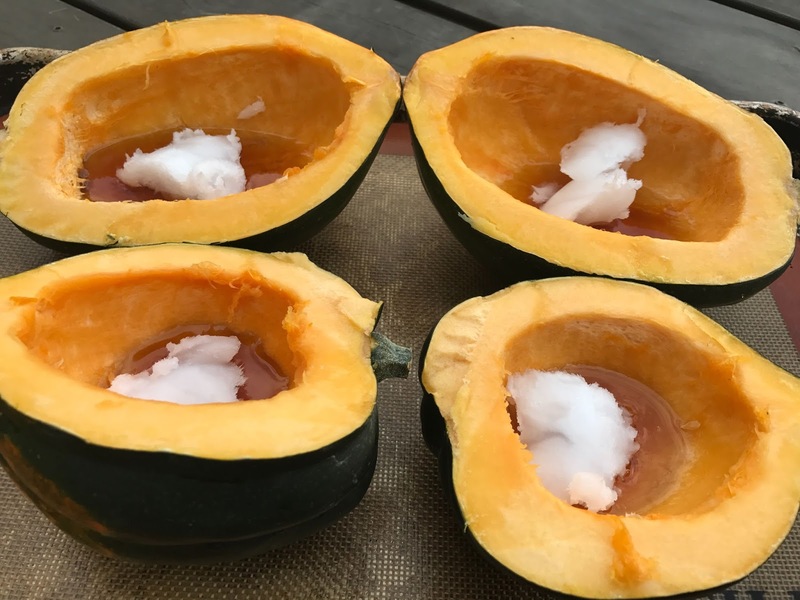 A one cup serving of Acorn Squash has just 115 calories, 9 grams of fiber, 37% DV of Vitamin C and so much more. Acorn squash happens to be one of my favorite winter squashes to bake. Maybe it's the small size, or the fact that it actually resembles an acorn, or maybe it's the gorgeous contrast between the outer shell and the bright orange interior. I tend to choose acorn squash that are firm and have a dark green exterior. I've personally found they have the best flavor when baked. Using a cutting board, and a sharp knife, I cut them length wise down the middle. Then I scoop out the seeds, and in their place I add a heaping tsp of coconut oil, and a TBSP of maple syrup. Then I pop them in the oven on a cookie sheet and bake for 1 hour at 350-375 degrees. They are golden and bubbling when done, and Oh So Good! It's like your own mini pumpkin pie on a plate. I serve these alongside Carrot Kale Salad and Simple Salmon Patties. And I'll often add any leftovers to my breakfast the next morning.